Jody Brown, LMT, works with athletes seeking pain relief, injury prevention, or improved performance. As a certified personal trainer and licensed massage therapist with extensive experience in manual therapy, Jody offers the experience you need to keep your body working in an optimal capacity during your training or recovery. Since 2002 she’s worked with a Division I university with golf, basketball, cross country, tennis, soccer, volleyball, and baseball athletes. She collaborates with the trainers to provide strategic support for injured athletes and to prevent future injuries. If you’re an athlete or weekend warrior preparing for your sport—whether a marathon, boxing match, or CrossFit competition—your body can benefit from therapeutic bodywork. Preventive bodywork helps avoid pain and injuries from overtraining. Training for the Chicago Marathon? 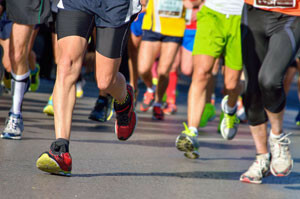 Help ensure a successful race by scheduling a massage with Jody. Schedule your session by calling (309) 369-6970 or contact Jody to discuss your training goals to determine how incorporating massage into your plan can enhance your performance. Injuries and pain happen. Clinical treatment of soft tissues using neuromuscular/trigger point release therapy to quickly get the body functioning without pain is Jody’s specialty. If you are undergoing rehabilitation from a sports injury, such as IT band injuries, hamstring pulls, goin pulls, low back pain, etc., then you can benefit from massage. Schedule your session by calling (309) 369-6970 or contact Jody to reduce your pain and speed up the healing process. "Jody truly listens to any issues that I am having and tailors each session to address those problem areas..." —Debi Z.